Bible Believers recently received 23 Farsi Messages (Persian) from a brother; within a week of receiving these messages 13 are now on the HUB and the remainder coming shortly. Believers from 12 different Farsi speaking countries now have access to the Message in their language. 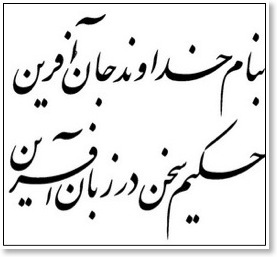 In written form the Farsi language (shown above) looks very different from most letter based languages. It uses the Perso-Arabic script which is a mix of the Arabic and Persian alphabet. There are over 60 million people, mainly in the Middle East and in Central Asia, that speak this language. Please pray that the Lord would cause these books to fall into the hands of his children and that these messages would touch the hearts and lives of those that speak the Farsi Language. Click here to go to the Message HUB and view these new Farsi messages.